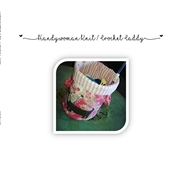 Perfect project for the knitter or crocheter. A nice large yarn caddy to hold all your needles and yarn and also your working yarn. Yes you can thread your working yarn through the grommet and just knit or crochet away with no worries. Fast and fun easy project. 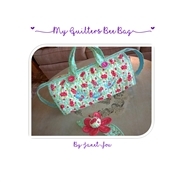 The Quilters Bee Bag is the biggest bag of it's kind and with the most pockets and pocket options available. You are going to LOVE this bag. The pattern includes an image for each step; making this pattern super easy to follow. There are detail instructions on how to insert the zipper so don't fret if you've never sewn a zipper into a project. This bag is large enough to carry all your quilting supplies with you to bee so all you'll have to do is grab this bag and your sewing machine and your ready to sew with your friends! The wrist pin cushion pattern is included!